The City of Delta Junction and the surrounding areas are served by two volunteer fire departments and a volunteer rescue squad. 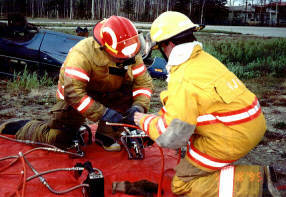 The City fire department volunteers include several cadet ‘apprentice’ firefighters. Rural Deltana Volunteer Fire Department volunteers have two stations, one in the Clearwater area and one in Big Delta. The local fire departments have mutual aid agreements with Fort Greely, Alyeska Pipeline Service Company at Pump Station 9, and the Alaska Department of Natural Resources, Division of Forestry in Delta. The Delta Rescue Squad works closely with personnel at the local medical clinic. Around-the-clock dispatch is provided. A radio tone alert summons firefighters or EMTs as needed.